The Sony Xperia Z Ultra LTE has been around for quite some time now but if you haven’t already gotten it or feel like trying out this gigantic smartphone that seems to be the bests size for a tablet, here’s something you might be interested in – DiGi is now offering the LTE version of Sony Xperia Z Ultra from as low as RM1,059; the retail price is RM2,199 according to DiGi (it’s listed as RM1,999 on Sony’s Online Store). Available only in Black, DiGi is offering the phablet with its DG SmartPlan 58/88/148 that comes bundled with free data, calls, SMS and even IDD calls. Do take note though, as with all the other phone bundles from DiGi, it ties you down to a 24 months contract. 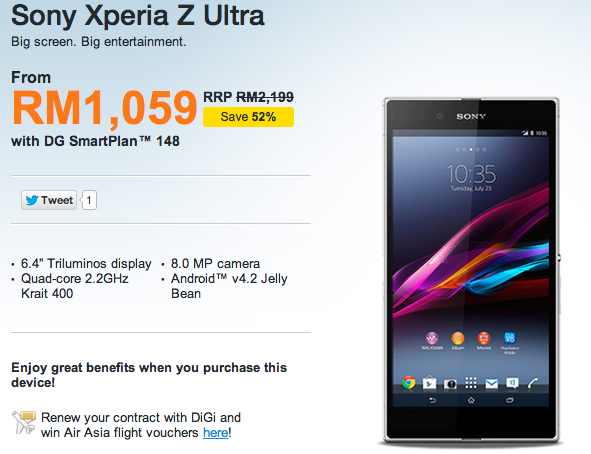 Just a friendly reminder, the Sony Xperia Z Ultra LTE was launched in Malaysia in October last year with a retail price of RM2,199 but it looks like Sony has decided to reduce the price. As with 3G version, it’s powered by a 2.2GHz quad-core Snapdragon 800 processor with 2GB of RAM, features a 6.44” Full HD Triluminos display, is IP58-rated for water- and dust-resistance. It has an 8MP rear shooter that unfortunately, is missing a very important feature – LED flash. Visit DiGi for more information about its Xperia Z Ultra phone bundle that is strangely not available with other telcos, even Celcom.